This new housing development in Penang is located within Juru township. It has 1,600 medium cost and affordable units. Ujung Batu is another affordable Penang Residential Property located within Bagan Dalam township in Butterworth. The housing development provides 600 low cost units. Tri Pinnacle is another Penang Property new project of affordable homes. It is located at Jalan Persiaran Halia 3, Mount Erskine. Tri-Pinnacle provides residents with a modern environment, so you can live, relax and work, It sets a new benchmark in affordable housing scheme in Penang. The built up area is 800 square feet and the initial price is RM 299,000. Ramah Pavilion is a Penang residential housing development by M Summit Group. This development has 759 affordable units in two blocks of 36 and 38 storey building. It is located next to Puspakom Teluk Kumbar. - Barbecue are, and more. One Forest housing development is just a few minutes away from Penang International Airport, located along Lengkok Kelicap. One Foresta has 2,685 affordable housing units, in four blocks of 41 and 42 storey towers. The built up area is 900 square feet with 3 bedrooms. Initial price start at RM 450,000 onwards. The Clovers, also known as Arasia Perdan is a residential property located just a few minutes away from Penang International Airport -- Sungai Ara. This condominium has 3 blocks of 42 storey with a total of 892 residential units. Out of these 892 residential units only 180 units are categorized under affordable housing. The built up area is 699 square feet onwards, with an initial price from RM 200,000. Affordable Housing: RM400,000 and below. i-Santorini is an affordable housing development located at Tanjung Tokong, Penang. - Parcel 1: two residential towers of 48 storey each for a total of 1,320 units. It also has 52 units of shop offices. - Parcel 2: 1 tower of 49 storey with a total of 835 units. It has 16 units of shop offices. The standard build up area of 850 square feet and both parcel come with an 8-level car park. Total units is 2,155. Granito is located next to TAR College. It has two residential towers featuring a 50-storey building and 12 levels of car park. The total of affordable homes is 980 units, with a built up area of 864 square feet with three bedrooms. Developer: PLB Land Sdn. Bhd. It is located by Ecoworld immediately opposite Majestic Heights. The initial price is from RM 298,000 and the build up area is 1,000 square feet. Mutiara Rini is located along Tun Dr. Lim Chong Eu Expressway, just a few minutes drive from the Penang Bridge. Mutiara Rini has 382 residential units, with a standard size of 900 square feet. The initial price is between RM 345,000 to RM 389,000. 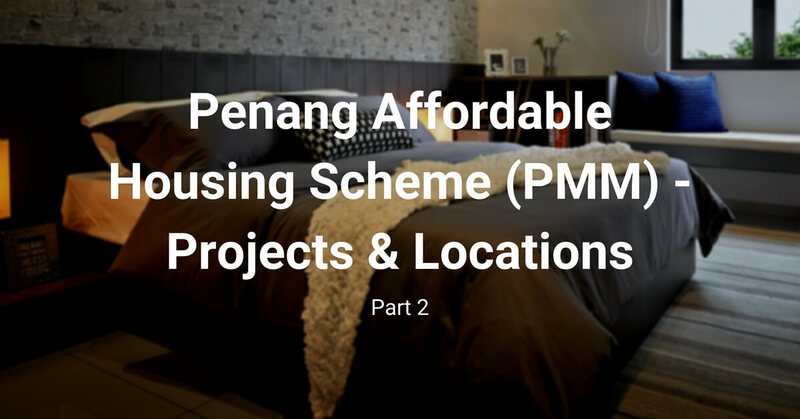 The Penang Affordable Housing Scheme (PMM) is a Penang State Initiative in an effort to provide quality housing at affordable prices for Penangites. Interested individuals are encouraged to apply through the state housing department. *Feel free to check the FIRST Part of Penang State Government Affordable Housing List.